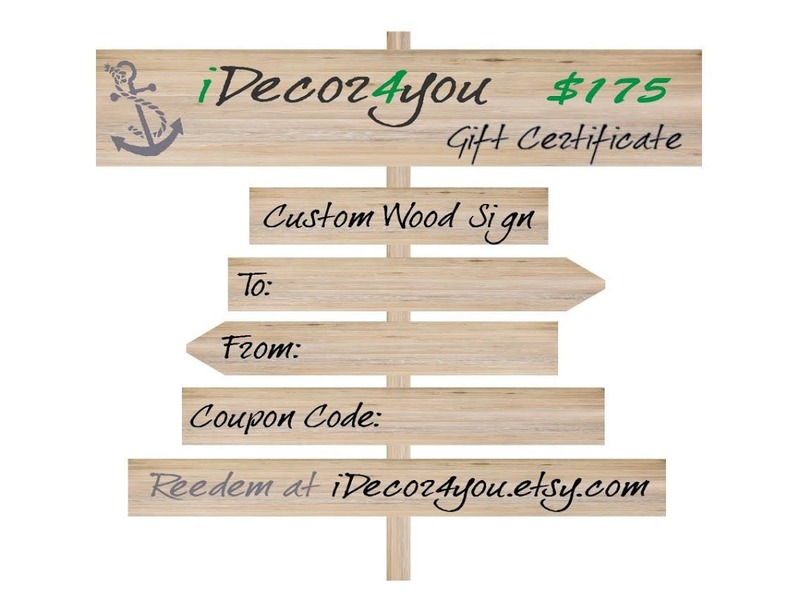 It is a Gift Certificate for Custom Wood sign. If you have a special person in your life that is a little hard to shop for, A gift certificate is the perfect solution, and a gift certificate for art is even better. This gift certificate can be used to design a one of a kind custom piece of art, and can only be used on purchases in this shop. These would be perfect for stocking suffers, co-worker, or teacher gifts. Under Gift Certificate section. This is a printable gift certificate. Once purchased, you will need to download a PDF or JPEG file and print out your 6in x 4in gift certificate. ►Download cards, print one or all of them. ►Give it to your friend. You will receive a unique gift code in a separate message. This gift code should be recorded on the gift certificate, along with your name, and the name of the recipient. Recipients can order anything they like, and enter coupon code, when check out! Easiest way to shop. Don't waste your time searching for something your Family or Friends may not like. Let them make a choice! They will love that!